Vision Truth Or Myth: Is Squinting Bad For Your Vision? There are a lot of wives tales out there. You can probably think of at least three off the top your head. This is especially true when it comes to eye health. For example, it has been commonly said that squinting is bad for your vision. It has also been said that reading in the dark can damage your eyes or that sitting too close to the television can permanently damage your vision (by the way, both of these are myths). When it comes to squinting, however, is this actually true, or is it just another myth that needs to be put to rest? Take a look at the answer below. Is Squinting Bad For Your Vision? The answer is no. Squinting is not bad for your vision, contrary to popular belief. This is yet another myth. Squinting actually increases your level of focus as your pupil gets smaller due to the fact that there is less light – this is called the pinhole effect. While squinting is not bad for your vision, if you are squinting a lot, this is a sign that you may have a refractive error (such as nearsightedness or farsightedness) and are in need of glasses or contacts in order to restore your vision. A refractive error results in blurry vision. So, squinting can actually help those with refractive errors see better by enhancing their focus. 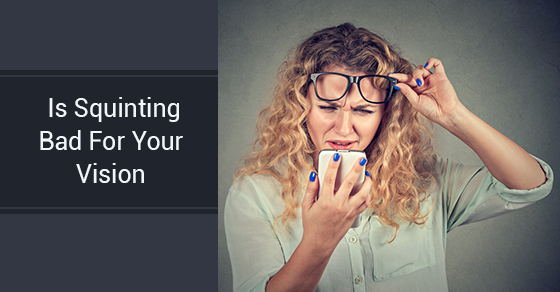 While squinting will not permanently damage your vision, it could potentially cause headaches due to the fact that you’re contracting the muscles of your face. Other than headaches, squinting poses no risk to your eye health. Keep in mind that if you have not had an eye exam in the past year, you should schedule an eye appointment with your doctor as soon as possible. In fact, it’s a myth that you only need to see your eye doctor when something is wrong. Eye exams should be scheduled every year as they not only protect your eyes but also offer insight into your overall health. For example, an eye doctor can also detect high blood pressure and diabetes during an eye exam. If you are interested in any of our vision procedures or cosmetic treatments, consider Skouras Eye and Cosmetic Centre. We are one of the leading comprehensive eye care facilities in Toronto. To schedule an appointment or for more information, contact us here.